Early Fish Commerce - Sale of Fresh-water Fish - Cured Fish - Influence of Rapid Transit on the Fisheries - Fish-ponds - The Logan Pond - Ancient Fishing Industries - The Dutch Herring Fishing - Zuyder Zee Herring Fishery - The Fishers of Friesland - The Herring in Holland - The Dutch Cure - Dutch Salmon - Salmon Fishing in Holland - Law of the Fishing. IN the absence of precise information, it may be guessed that even during the far back ages fish was esteemed as an article of food, and formed an important contribution to the diet of such peoples as had access to the sea, or who could obtain the finny inhabitants of the deep by purchase or barter. In the Old and New Testaments, and in various ancient profane histories, fish and fishing are frequently mentioned; and in what may be called modern times a few scattered dates, indicating the progress of the sea fisheries, may, by the exercise of great industry and much research, be collected; but these are not in any sense consecutive, or indeed very reliable, so that we are, as it were, compelled to imagine the progress of fish commerce, and to picture in our mind’s eye its transition from a period when the mere satisfaction of individual wants was only cared for, to a time when fish began to be bartered for land goods—such as farm, dairy, and garden produce—and to trace, as we best can, that commerce through these obscure epochs to the present time, when fisheries form a prominent outlet for capital, are a large source of national revenue, and attract, because of these qualities, a degree of attention never before bestowed upon them. Fish commerce being an industry naturally arising out of the immediate wants of mankind, has unfortunately been invested with an amount of exaggeration having no parallel in other branches of industry. Blunders perpetrated long ago in natural histories and Encyclopedias, when the life and habits of all kinds of fish, from the want of investigation, were but little understood, have been, with those additions which under such circumstances always accumulate, handed down to the present day, so that even now we are carrying on some of our fisheries on altogether false assumptions, never dreaming that there will be a fishing to-morrow, which must be as important, or even more important, than the fishing of to-day, beyond which the fisher class never look. It is curious to note that there was in most countries a commerce in fresh-water fish long before the food treasures of the sea were broken upon. This is particularly noticeable in our own country, and is vouched for by many authorities both at home and abroad. We can all imagine, also, that in the prehistoric or very early ages, when the land was untilled and virgin, and the earth was undrained, there were sources for the supply of fresh-water fish that do not now exist in consequence of the enhanced value of land. At the period to which I have been alluding there was a much greater water surface than there is now— rivers were broader and deeper, as also were our lakes and marshes. In those early days, although not so early as the remote uncultivated age of which I have spoken, there were great inland stews populous with fish, especially in connection with monasteries and other religious houses, many examples of which, in their remains, may be seen in England and on the Continent. In fact, fish commerce, in despite of many curious industries connected with the productiveness of the fisheries, was not really developed till a few years ago, when the railway system of carriage began. Even up to the time of George Stephenson commerce in fish was, generally speaking, a purely local business, except in so far as fishwives could extend the trade by carrying the contents of their husbands’ boats inland, in order, as in more primitive times, to barter the fish for other produce. The fishermen of Cornacchio, for instance, still cure their eels, because they have not the means of sending them so rapidly into the interior of Italy as would admit of their being eaten fresh. Scotch salmon in the beginning of the present century was nearly all kippered or cured in some way as soon as caught, because the demand for fresh fish was purely local, and therefore limited. With the discovery that salmon packed in ice could be kept a long time fresh, trade in that fish began to extend and the price to rise. This discovery, which exercised a very important influence on the value of our salmon-fisheries, was made by a country gentleman of Scotland, Mr. Dempster of Dunnichen, in 1780. Steamboat and railway transit, when they became general, at once converted salmon into a valuable commodity ; and such became the demand, from facility of transport, that this particular fish, from its great individual value, has more than once been in danger of being exterminated through the greed of the fishery tenants. The network of railways which now encircles the land has conferred upon our inland towns, so far as fish is concerned, all the advantages of the coast. For instance, the fishermen of Prestonpans send more of their fish to Manchester than to Edinburgh, which is only nine miles distant : indeed our most landward cities are comparatively well supplied with fresh fish and crustacea, while at the seaside these delicacies are not plentiful. The Newhaven fishwife is a common and picturesque visitant of many of the larger Scottish inland towns, being able by means of the railways to take profitable journeys; indeed, one consequence of the extension of railways has undoubtedly been to add enormously to the demand for sea produce, and to excite the ingenuity of our seafaring population to still greater cunning and industry in the capture of all kinds of fish. In former years, when a large haul of fish was taken, there was no means of despatching them to a distance, neither was there a resident population to consume what was caught. Railways not being in existence, the conveyance of the period was too slow for perishable commodities, and visitors to the seaside were also rarer than at present. The want of a population to eat the fish no doubt aided the comfortable delusion of our supplies being inexhaustible. But it is now an undoubted fact, that with railways branching to every pier and quay, our denselypopulated inland towns are better supplied with fish than the villages where they are caught-a result of that keen competition so noticeable where fish and other sea delicacies are concerned. High prices form an inducement to the fishermen to take from the water all they can get, whether the fish be ripe for food or not. A practical fisherman, whom I have often consulted on these topics, says that forty years ago the slow system of carriage was a sure preventive of over-fishing, as fish, to be valuable for table purposes, require to be fresh. " It's the railways that has done all the mischief, sir ; depend on that ; and as for the fishing, sir, it's going on at such a rate that there will some day be a complete famine. I've seen in my time more fish caught with a score of hooks on a line than can now be got with eight thousand ! " At one time it was usual for noblemen and other country gentlemen to have fish-ponds ; in fact, a fish-pond was as necessary an adjunct of a large country house as its vegetable or fruit garden. 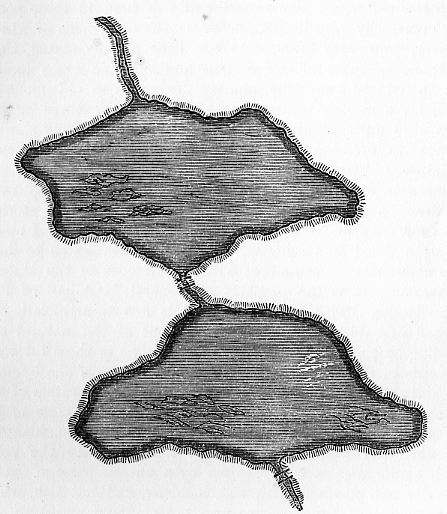 These ponds, as the foregoing sketch will show, were of the most simple kind, and were often enough constructed by merely stopping a little stream at some suitable place, and so forming a couple of artificial lakes, in which were placed some large stones, or two or three bits of artificial rockwork, so constructed as to afford shelter to the fish. In those days fish-ponds were a necessity to noblemen and gentlemen in the habit of entertaining guests or giving great dinner-parties ; hence also the multiplicity of recipes in our older cookery-books for the dressing of all kinds of fresh-water fishes ; besides, in ancient times, before the Reformation, when Roman Catholicism required a rigorous observance of church fasts, a fish-pond near every cathedral city, and in the precincts of every monastery, was a sine qua non. The varieties of fish bred in these ponds were necessarily very limited, being usually carp, some of which, however, grew very large. As has been already stated, there are traces of some of our curious and valuable fishes having been introduced into this country during those old monastic times. As already shown, most fish-ponds of these remote times were quite primitive in their construction-very similar, in fact, to the beautiful trout-pond at Wolfsbrunnen, near Heidelberg. There were no doubt ponds of large extent and of elaborate construction, but these were comparatively rare ; and even on the sea-coast we used to have ponds or storing places for sea fish. One of these is still in existence : I allude to Logan Pond in Galloway, for keeping fish so as to have them attainable for table uses 'without reference to the state of the weather, it is the property of General M'Douall of Port Logan House. This particular pond is not an artificially-constructed one, but has been improved out of the natural surrounding of the place. It is a basin, formed in the solid rock, ten yards in depth, and having a circumference of one hundred and sixty feet, a wall of loose stones admits the waters of the sea through a chasm of rock, and prevents the egress of the fish. The fish which it contains are taken in the neighbouring bay when the weather is fine, and transferred to the pond, which communicates with the sea by a narrow passage. It is generally well stocked with cod, haddock, and flat fish, which in the course of time become very tame; and I regret to say, from want of proper shelter, most of the animals become blind. The fish have of course to be fed, and they partake greedily, from the hand of the woman who feeds them, of the mass of boiled mussels, limpets, whelks, etc., with which they are regaled, and their flavour is really unexceptionable. Coming back, however, to the subject of fresh-water fishponds, it may be stated that these have been long given up, except as adjuncts to the amenities of gentlemen's pleasure grounds. Ornamental canals and fish-ponds are not at all uncommon in the parks of our country gentlemen, although they are not required for fish-breeding purposes, because the fast London or provincial trains carry baskets of fish a distance of one hundred miles in a very few hours, so that a turbot or a dish of whiting may be in excellent condition for a late dinner. a reservoir of water in their shell. Sea fishers of the olden time dealt with the fish for the purpose of their being cured with salt or otherwise, simply, as has already been stated, because of the want of rapid carriage and a comparatively scanty local population. The particular fishing industry which has bulked largest in literature, and was pursued in a systematic way, is, or rather was, that of the Dutch, for Holland does not at present make her mark so largely on the waters as she was wont to do, being at present surpassed in fishing enterprise by Scotland and other countries. The particular fish coveted by the Dutch people was the herring. A set of engravings which I procured in Amsterdam convey a graphic idea of the great importance that was attached by the Dutch themselves to their herring-fishery. This series of sixteen peculiarly Dutch plates begins at the beginning of the fishery, as is indeed proper it should, by showing us a party busy at a sea-side cottage knitting the gerring nets ; one or two busses are seen in the distance busy at work. We are then shown, on the banks of one of the numerous Dutch canals, a congregation of quaint-looking coopers engaged in preparing the barrels, while next in order comes a representation of the preparing and victualling of the buss, which is surrounded by small boats, and crowded with an active population engaged in getting the vessel ready for sea-barrels of provisions, breadths of netting, and various necessaries, are being got on board. Then follow plates, of which the foregoing is a specimen, showing us the equipment of various other kinds of boats, which again are succeeded by a view of the busses among the shoals of herring, the big mast struck, most of the sails furled, and the men busy hauling the nets, which of course, as is fitting in a picture, are laden with fish. Various other boats are also shown at work, as the great hey, a one-masted vessel, that is apparently furnished with a seine-net, and the great double shore or sea-boar, which is an open boat. Then we have the herring-buss coming gallantly into the harbour, with its sails all set and its flags all flying--its hull deep in the water, which seems to frolic lovingly round its prow, as if glad at its safe return. Next, of course, there is a scene on the shore, where the pompous-looking curer and his servants are seen congratulating each other amid the bustle of surrounding commerce and labour; dealers, too, are figured in these engravings, with their wheelbarrows drawn by dogs of unmistakable Dutch build, and there are also to be seen in the picture many other elements of that industry peculiar to all fishing towns, whether ancient or modern. The next scene of this fishing panorama is the herring banquet or feast, where the king, or mayhap the rich owner of a fleet of busses sits grandly at table, with his wife and daughter, attended by a butler and a black footman, partaking of the first fruits of the fishery. After this follows a view of the fish-market, with portraits of the fishwives, altogether thoroughly indicative of their peculiar way of doing business, which is always the same, whether the scene be laid in ancient Holland or modern Billingsgate. Next comes a picture of the various buyers of the commodity on their way home, of course by the side of a canal, with their purchases of deep-sea, shore, state, and red herrings. The next scene of the series is a smoking-house, partially obscured by wreaths of smoke, where the herrings are being red-ed; and the series is appropriately wound up with a tableau representing the important process of repairing the damaged nets-the whole conveying a really graphic, although not very artistic, delineation of what was once a highly characteristic Dutch industry. A few plates illustrative of the whale-fisheries of Holland are appended to the series I have been describing-for whale-fishing was at one time one of the industries of the hard-working Dutch. The old saying of Amsterdam being built on herring bones was frequently used to symbolise the fishing power of Holland. It is thought that the attention of the Dutch people was first drawn to the value of the sea fisheries by the settlement of some Scottish fishermen in their country. I cannot vouch for the truth of this statement as to the Scottish emigration, but I believe it was a Fleming who first discovered the virtues of pickled herrings, and it is also known that the capture of the herring was a chief industry on the sea-board of all the Low Countries : it is likewise instructive to learn that at a time when our British fisheries were very much undeveloped the Dutch people found our seas to be a gold mine, so productive were they in fish, and so famous did the Dutch cure of herrings become. We are not willing, however, to credit all the stories of miraculous draughts, and store of wealth garnered up, by the plodding Hollanders. We must bear in mind that when the Dutch began to fish, the seas, as a field of industry were nearly virgin, and that that people at one time kept this great source of wealth all to themselves. At that particular period there was no limit to the supply, fishermen having only to dip their nets in the water to have them filled. No wonder, therefore, that the fisheries of Holland became a prominent industry, and in time the one absorbing hobby of the nation. Busses in large fleets were fitted out and manned, till in time the Dutch carne to be reputed the greatest fishers in the world. But great as was the fishing industry of those days in Holland, and industrious as the Dutch undoubtedly were, there has been a considerable amount of exaggeration as to the results, more especially in regard to the enormous quantities of fish said to have been captured and cured. But whatever this total might be was not of great consequence, for the mere quantity of fish caught is perhaps, although a considerable one, the smallest of the many benefits conferred on a nation by an energetic pursuit of its fisheries. The fishermen must have boats, and these must be fitted with sails, rigging, etc. ; and, moreover, the boats must be manned by an efficient crew ; then the curing and sale of the fish give employment to a large number of people as well ; whilst the articles of cure-as salt, barrels, etc. - must of necessity be largely provided, and are all of them the result of some kind of trained industry: and these varied circumstances of demand combine to feed the particular industrial pursuit I am describing. Besides, the fisheries provide a grand nursery for seamen, which is, perhaps, in a country like ours, having a powerful navy, the greatest benefit of all. I have taken the pains to collate as many of the figures of the ancient Dutch fishery as I could collect during an industrious search ; and I find that, in the zenith of its prosperity, after the proclamation of the independence of the States of Holland, three thousand boats were employed in her own bays, while sixteen hundred herring busses fished industriously in British waters, and eight hundred larger vessels prosecuted the cod and whale fisheries at remote distances. In the year 1603 we are informed that the Dutch sold herrings to the amount of £4,759,000, besides what they themselves consumed. We are also told that in 1618 they had twelve thousand vessels engaged in this branch of the fishery, and that these ships employed about two hundred thousand men. It must have been a splendid sight, on every 24th of June, to witness the departure of the great fleet from the Texel; and as most of the Dutch people were more or less interested in the prosperity of the fishery, either as labourers or employers of labour, there would be no lack of spectators on these occasions. The Wick herring drave of a thousand boats is an industrial sight of no common kind ; but it must give way before the picturesque fleet of Holland, as it sailed from the Texel about three hundred years ago. It is interesting to see the Holland of to-day, and to compare its fishing fleets with those of other nations. Flat fish are the specialite of the Dutch sea fisheries, eels ranking next, vast numbers being taken in the canals of South Holland, while large quantities are obtained from the numerous lakes of Friesland. An active fishery of a miscellaneous description is likewise carried on in the Zuyder Zee. The fishermen who frequent that water capture in particular a small herring, locally known as pan-fish, and they likewise obtain great supplies of anchovies, or rather sprats, as well ; but in South Holland the fish chiefly taken are soles and flounders. At Scheveningen there are about one hundred and forty boats engaged in this kind of fishery, and also in the red-herring fishery-that is, in capturing herrings which are ultimately smoked. It is interesting to observe the fishing fleet come in to Scheveningen: there being no harbour at that place, the vessels have to sail right upon the sandy beach. The luggers are admirably constructed for that purpose, being flat bottomed as well as blunt bowed, and having, instead of a keel, a large wooden wing at each side, for the purpose of keeping the ship steady. So built, these boats can run quite safely against the shore, although it surprises one not acquainted with the circumstances to see them float right on to the beach with all their sails set. As soon as the vessels take the ground, the crew commence to wade ashore with the produce of the fishery - generally flounders, plaice, and soles, packed in wicker baskets of tolerable size. The women, as is the case in most fishing - places, are at hand to receive and carry away the produce ; and when any very small fish are taken, they fall to these female carriers as a perquisite. The vessels are each fitted with a couple of light trawl nets, which are hauled to the mast-head to be dried, on the ship arriving at the beach. The Dutch fish on the numerous banks of the German Ocean, only, however, for flat fishes : they have done very little of late in the way of local line-fishing, partly, no doubt, from the want of mussels for bait, and partly from the custom which has so long prevailed of following after one kind of fish. The Dutch have, however, a winter cod-fishery, to which their busses proceed after knocking off from what is called in Holland the great fishery. There are no shell-fish about this part of the Netherlands, but large quantities are obtained in other places. At the western side of the Texel, I was told there were both oyster and mussel fisheries, and at Bruinesse, in Zealand, there are fifty or 'sixty boats employed in obtaining these molluscs. I could not learn that any lobsters or crabs were taken at the places I visited ; but, as there are no rocks among which they can find a fit dwelling-place, crustaceans cannot be expected. Mr. Maas of Scheveningen intends to introduce a shore line-fishery. I asked him where he would get bait. "Oh," he replied, "I can get thousands of splendid lampreys." Only think of such fine fish being cut up for bait ! Would it not pay better to send them to London. The herring-fishery on the Zuyder Zee has no connection whatever with the great fishery; it is a miscellaneous fishery for winter herrings and sprats, which are cured in different ways, also for the universal flounder and the abounding eel ; whilst the great fishery is for the herring only. Many of the fishermen stay out at sea in their beautifully clean half-decked boats during the week, and only come home to their families on Saturday night, their cargo being taken from time to time, as it accumulates, to the curer. The quaint races of fishermen who dwell on the curious islands of Marken, Urk, and Shokland, leave their homes at midnight on Sunday, and, if they find fish, do not return till the following Saturday. There are about twelve hundred boats of all kinds fishing on the Zuyder Zee, and numerous smokeries have been erected for smoking the herrings. The people are now becoming very proficient in this branch of the fishery business, which was inaugurated by the fishermen of Dieppe during the twelfth century. 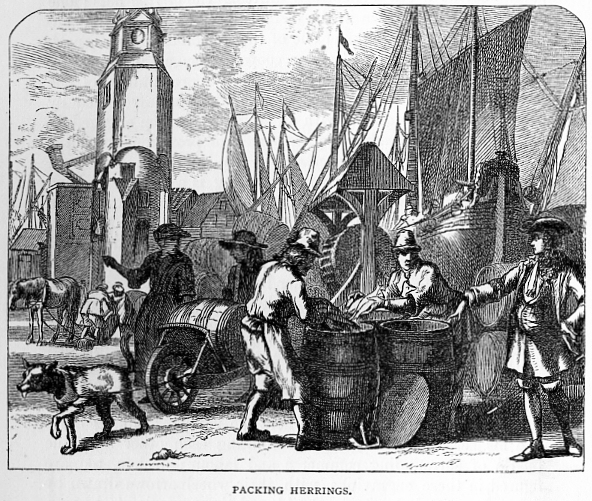 The Dutch do not esteem the fresh herring as we do in Britain-indeed the Zuyder Zee herrings are in a measure despised-still the fresh herring fishery is of considerable value, and yields about £40,000 a year to Scheveningen, Catwyk, and Noordwyk, not to speak of what it brings in to Monniekendam, Enkhuizen, Wollenhove, and numerous other little fishing towns or hamlets. I found it exceedingly difficult to procure reliable statistics of the produce of the fisheries carried on in the Zuyder Zee, but was told that the eels which are annually caught may be valued at 85,000 florins, and that. the sprat fishery will produce four times that amount of money. As to the fresh herring fishery, the figures, although they were double the amount stated above, would, after all, be modest, compared to those of the Scottish herring fishery. The Frieslanders are mighty fishers ; two-thirds of their fishing craft are on the Zuyder Zee, and their part of the country, as may be seen from any map, is full of lakes, some of them of large size. The Frisons derive wealth from the waters as well as from their peat grounds, and many of their lakes and fish-ponds have been formed out of holes created by carrying away the peat. The Frison people also carry on fishing industries on the islands of Ter Schelling and Ameland, which lie opposite their coast, and which were once united as a part of the land. Then, again, there is a fishery at Hourn ; and Hourn is celebrated : it gave to Holland the famous navigator who doubled the Cape which he called after his birthplace. There are about two hundred fishermen there, men quite as industrious as their opposite neighbours, the Frisons. There is no doubt that the Dutch are reviving their fisheries ; but it is amusing to hear everywhere of the former greatness of this branch of industry, and to contrast it with what now prevails. It is instructive to note that some of the towns in Holland, which were at one time famous and wealthy fishing ports, are fast fading away into rains. There is Enkhuizen, which, long ago, sent a fleet of one hundred and fifty mighty vessels to the "great fishery," escorted by a squadron of war-ships, now sending only seven vessels ; but the greatness of the place has passed away, and that town at present is but a wreck or shadow of its former self. Most of the fish taken by the Dutch are sent out of Holland-the eels to Billingsgate, the flounders to Belgium, the turbot to London or Paris, and so forth. The fish-markets of the chief towns of Holland are but poorly supplied with what was once the staple article of the country-another illustration of that old proverb which tells us about the scarcity of coals at Newcastle-on-Tyne. One would suppose the herring in Holland to be an altogether different animal from the fish which bears that name in Great Britain. The Dutch reverence the stork, but they almost worship the herring ; it is without question their national fish, and they most lovingly eat it-raw out of the pickle ! and some of the people are so fond of it that they devour it, bones, fins, and all. Amsterdam is reputed to have been founded on herring bones ; and whatever greatness Holland has achieved in commerce has undoubtedly grown from the apprenticeship served by its sons on the waters, in the days when the greatness of the nation arose from its fisheries. Although the herring fishery of the Netherlands has fallen off greatly from what it was, it is again reviving ; and the shipowners of Holland talk confidently of renewing the ancient glory of their "herring drave," which at one time was the most gigantic fleet upon the seas. In the meantime, although the trade in herrings be comparatively small, the individual love of the fish is as great as ever. In all towns and cities of that remarkable country there are shops for the sale of this fish, and in these shops there are always to be found numerous persons partaking of that most choice delicacy - a pickled herring. One requires to be among the Dutch when the arrival of the new fish takes place, to understand the universal love of the people for the herring. It is wonderful to note the enthusiasm which is developed the moment it becomes known that the new fish have come to hand. A fast vessel brings in the first fruits of the cure from the ocean fleet, and lo ! the people burst into a demonstration. At one time they used to deck the steeple of Vlaardingen Church - Vlaardingen is now the chief herring port-and ring a joyful peal of bells. The curers and shipowners decked their houses with flowers ; and persons who sold the fish decorated their signboards, in order to let the public know that the newly-cured delicacy had arrived. Then rival curers sent off a sample of their herrings to the king ; and many a rapid race has been run to the Hague, in order to have the honour of being first in the field, and so obtain the reward of five hundred guilders which were given on the occasion. There is not now, I believe, so much outward demonstration ; but the first fruits of the fishery are as valuable as ever, a single herring often costing a couple of guilders ! Herrings are usually served raw in Holland, with a sauce of vinegar, cucumber, etc. ; they are also dressed with salad, and are likewise eaten au naturel. No stranger should leave Holland without making trial of the national dish ; it is as delicious in its way as the Scotch kipper herring, or as the exquisite broiled fresh herring of Lochfyne, and almost beats the famous "splitbellies " of the Moray Firth fishing towns. It is curious that while the State has ceased to interfere in any way with the herring fishery, the size of the mesh, the mode of fishing, and all other details, being left to the honour of the boat owners, it still regulates with jealous care the cure of the fish. The curing laws are carried out as 'rigorously as ever : the captains are sworn to do their duty in seeing that the herrings are properly cured. Scottish herrings-and it is in Scotland we now find the really "great" fishery for the poor man's fish-are cured on shore. Dutch herrings, again, are cured on board the vessel that captures them; and there is no question but that their cured herrings are superior to ours, although I think they would be still better if Government would let them alone, and let each curer stand or fall by the perfection of his individual cure. It is certain that a great deal of pains is taken with the manipulation of the herring on board the Netherland busses ; and at one time the Dutch mode,of cure was kept a profound secret, it being a strict rule that no stranger should be admitted on board the fishery vessels. The superiority of the Dutch cure is said to be owing to the use of a superior kind of salt, which the boat-owners take great pains to procure, and to purify still further after they obtain it, and also to the very careful selection and assorting of the fish into different classes, as "full" herrings, "Matjes," etc. Only a portion of the intestines is taken out of the herring by the Dutch ; they content themselves with removing the gills and stomach, leaving the crown-gut in the fish. The herrings, as fast as they are prepared, are thrown into a strong brine, in which they are kept for eighteen hours before being packed in the barrels. It is an imperative rule of the great fishery that all herrings taken on one day must be cured during that day; herrings that cannot be cured on the day they are caught must be thrown overboard, or as an alternative they may be so packed as to be sold for inferior fish. There is a penalty of 300 guilders exigible from the master of the buss in case he should fail to perform his duty according to rules which are laid down for his guidance. As I have said, great pains are taken to procure fine salt. All the fish caught before St. James's Day are cured with Spanish or Portuguese salt ; those fish are known as herrings of the large salt ; the herrings cured after that date are known as herrings of the fine salt, only the finest Dutch-made small salt being used. Then it is a rule of the great fishery that barrels made of new and good oak only must be used. A small steamer in attendance on the fleet starts off to Vlaardingen as soon as it can collect a hundred barrels of fish, the " hunters " or " yagers " in attendance on the fishery vessels, follow as rapidly as they can, the first one after the steamer with 120 barrels, the second one with fifty more, etc., and the first fish bring the great prices already alluded to. In consequence of the crew having both to fish and to cure, the mass of the herrings taken cannot be dealt with so as to receive the Government brand ; they lie in salt, therefore, in the vessel, and after arriving at home, are taken out and smoked, but of course only realise an inferior price. Having been told that Dutch salmon was excellent, large in size, and delicious in flavour, and knowing that a considerable quantity of that fish is annually sent to London,-indeed Rhine salmon are now sold in Edinburgh in December, - I felt anxious during a visit to the Netherlands to obtain reliable information about the Dutch salmon fisheries. The Rhine having many mouths in Holland, I expected to see salmon everywhere in that country, and to find it cheap, but in that I was disappointed. There can be no doubt that the mighty father of waters contains in his liquid bosom a great army of fish. The fish breeding and feeding grounds of a river which has a course of nine hundred miles, and which is supplemented, on its way to the sea, by hundreds of minor streams, must be numerous and productive, but for all that I was told that Rhine salmon were not so plentiful in Holland as they had once been. No wonder. A salmon river and its tributaries, to be thoroughly economised, requires, like the Duke of Richmond's Spey, to be under the management of one person, or at any rate to be subject to some one set of laws. But as the Rhine flows through several kingdoms, such an arrangement is obviously impossible. A fish may be bred in some far away tributary, and after passing through the territory of the King of Prussia, may be captured in Holland ! Although salmon are now comparatively scarce in Holland, I was told the old story of its having been once so plentiful that apprentices used to bargain against eating it oftener than twice a week ! Now, I daresay they never see it except on rare holiday occasions, it being quite as dear in Holland as in London, averaging about Is. 8d, per pound, and from all I can learn never likely to be cheaper under present circumstances,-Is. 4d. per pound weight being about the price at which salmon is sold to the dealers. The fish is, of course, dearer when bought retail. Salmon fisheries in Holland appear to be well managed, so far as capturing the fish is concerned, some of them being fished very systematically. I paid a visit to one on the Maas, a few miles above Rotterdam, and easily accessible by means of the steamer to Dordrecht. It is worked by a company of gentlemen in Rotterdam, who rent it from Mr. Van Briennan, and it is situated on a terrace on the right bank of the river-that is, it is worked from the terrace which is fitted up for the purpose. Except during the fence months, which the Company are careful to observe, the fishing is worked night and day, the nets being tugged out from the upper end of the terrace by means of a small steamboat, which, sweeping down the river for about a mile, lands the fish at a stage constructed for the purpose, when they are at once carried in a hand net to a large floating iron tank, pierced with the necessary holes for permitting a full supply of water, there to be kept alive till they are required for market. Buyers from Rotterdam and elsewhere come to a plateau on the opposite side of the river, and hold a market every morning. The fish are then killed by the fishers, and carried across to the selling place, where they are sold at so much per fish, the persons buying being quite able to discern the weight and quality of each salmon by looking at it. I was not present at any of the sales, but I was told that they were " Dutch auctions," there being always a few persons to compete. This salmon fishery, so far as I could judge from a visit of a few hours, is remarkably well conducted ; the capture of the fish goes on by night as well as by day, so that about thirty hauls of the nets are obtained every twenty-four hours-there being a cessation from labour at the flow of the tide. A considerable number of salmon are taken at this fishery, as many as seventy having been frequently caught in a day (and night) - a common take being fifty or sixty. During the time of my visit, twelve hauls of the nets were made by hand-the steamer being under repair-with a result of eighteen fish : on that day the total capture was sixty-six fish, which produced a sum of £67 : 15s.-being a little over one pound sterling per fish; and as the average weight of the Maas salmon is fifteen pounds, the sum I have named gives Is. 4d. per pound weight as the price. Upwards of thirty men and half-a-dozen boys, in addition to an overseer, are employed at this fishery on the Maas, and their wages average about 18s. a week each. These men live in a bothy, and only go home on the Saturdays. None of the persons employed are allowed to drink spirituous liquors, but a plan to provide food for them at a general table was not successful ; they now mess individually or in groups at their bothy as best suits them. The superintendent has a pleasant house to live in, and about double the wage of the men under him. The Company weave and dye their own nets in the winter time. Each set of nets is 2000 feet in length, and 33 feet deep, and at the Van Briennan fishery three sets of nets are kept constantly at work night and day, as I have already stated. When the steamboat engaged in this fishery is disabled, as happened to be the case during my visit, horses are called into requisition, in order to wind in the nets by means of a very powerful wheel windlass. The fishing is by law suspended from November till February, and also during every flow of the tide. An act of parliament regulates the size of the mesh, and prohibits the use of all fixed nets. The Dutch people won't allow the Maas to be called a branch of the Rhine, or their fish to be called Rhine salmon, which the superintendent of the Van Briemian fishery said were inferior fish, but in this he is evidently wrong. The total quantity of salmon taken from the waters of Holland and from the lower Rhine is, of course, very large, great quantities of them being sent to Paris, Brussels, London, Edinburgh, and other populous places. The Scottish people, and they are good judges, do not like the Dutch salmon so well as their own fine curded fish; those taken in the estuaries of Holland are too oily and rich, whilst those taken a few hundred miles up the Rhine are rather lean and flavourless to suit the epicures of Scotland.